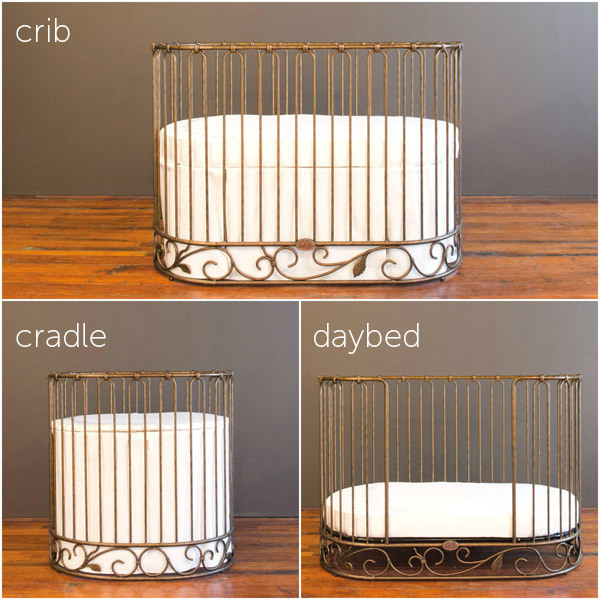 show more >>> The J'adore is heirloom iron luxury at its best, and it's so much more than just a crib. It is a round nursery sleep system that is actually 3 beds in 1. The first bed your newborn will use, a sophisticated cradle, turns into a beautiful crib and then an elegant daybed. Bratt Decor’s round sleep systems combine brilliant design with luxury styling to keep your baby surrounded in style and sophistication from birth throughout the toddler years. Our aged gold finish is dark and rich as opposed to a bright yellow hue, with variations in the hand applied patina adding depth and interest. Opt for the daybed kit and continue your look throughout your child's toddler years. This crib is the same size as STOKKE®. All of our cribs are designed to the highest safety standards and meet or exceed those set by the U.S. Consumer Product Safety Commission and American Society for Testing and Materials. Each crib is tested by independent laboratories for compliance with US crib regulations. Does NOT include cradle pad, mattress or bedding. The quality is exceptional and the powder coated finish with a hand distressed top coat ensures tough finish that is silky to the touch. Crafted of durable wrought iron for years of lifelong wear. 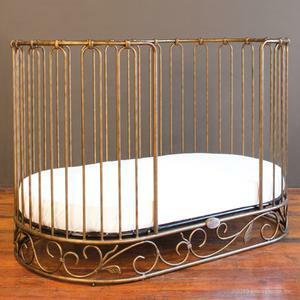 Bratt Decor j'adore crib-cradle vintage gold The J'adore is heirloom iron luxury at its best, and it's so much more than just a crib. It is a round nursery sleep system that is actually 3 beds in 1. The first bed your newborn will use, a sophisticated cradle, turns into a beautiful crib and then an elegant daybed. Bratt Decor’s round sleep systems combine brilliant design with luxury styling to keep your baby surrounded in style and sophistication from birth throughout the toddler years. Our aged gold finish is dark and rich as opposed to a bright yellow hue, with variations in the hand applied patina adding depth and interest. Opt for the daybed kit and continue your look throughout your child's toddler years. This crib is the same size as STOKKE®. All of our cribs are designed to the highest safety standards and meet or exceed those set by the U.S. Consumer Product Safety Commission and American Society for Testing and Materials. Each crib is tested by independent laboratories for compliance with US crib regulations. skirt length - top position: 14"
skirt length - middle position: 10"
skirt length - lowest position: 6"
special features : Starts as a cradle, converts to a crib with no additional purchase necessary. Optional daybed kit available and sold separately. Carton 1: 51" x 37.25" x 7.5"
Bought this for my daughter, and she and her husband love it. It is simply beautiful! The quality is excellent, and we can't stop looking at it! I had always dreamed of a round or oval crib. People told me it wasn't practical and wouldn't look just right. The J'adore crib is perfect in our nursery. We didn't find out the gender of our baby until delivery. I planned a gender neutral nursery using the J'adore crib in vintage gold and it turned out beautifully. I ordered the white sheets from Bratt and had custom bedding made. Everything has been fantastic and our baby boy sleeps perfectly in his crib! So happy that I chose this adorable crib! Very beautiful and wonderful quality. Can't wait for our baby girl to arrive so she can enjoy it! Thank you Bratt Decor for the great service and lovely crib! We got this crib and joy changer pewter for our baby-girl! Everything is perfect about these items - they are very solid, great quality and design. If we will have one more child, we will order the furniture for him/her from BD! My husband and I knew that we did not want the typical crib but wanted a circle/oval crib. We searched and searched until we came across the J'adore craddle-crib and instantly fell in love. It was different, unique and just what we wanted. An all in one crib from infant to toddler. The staff was great to work with and very responsive. They assisted us with all questions we had and although we were in California there was no delay from them in responses all questions were answered immediately. They processed the order for us right away and when the crib arrived it confirmed we made the right choice. It is perfect in our son's room and put the perfect touch to complete his nursery. Thank you Bratt Decor!